And I'm back! Sorry for randomly taking a week off but after a weekend out of town for Memorial Day followed by exam week at school while also kicking off four days of wedding festivities for my sister I had way too much going on to blog. Now that the parties, cookouts, ceremonies and work is finally over I am getting back into reality and getting caught up on grocery shopping, laundry and life in general. I really wanted to make sure that I made it to Publix during this sale cycle for two reasons: peanut butter and Hofmann's Hot Dogs. Justin is obsessed with Hofmann's which are apparently something his family loved in Upstate New York. Our Publix's just started carrying them and since they are usually pretty pricey I wanted to take advantage of the BOGO sale on them and get him two packs. You may be wondering why I bought so much peanut butter. Remember last year when (on this exact day actually) I also stocked up on peanut butter for the year? Well we went through it all and more in the past twelve months so I went ahead and took advantage of a BOGO sale and a $10 mail in rebate to get our year's supply again this week. 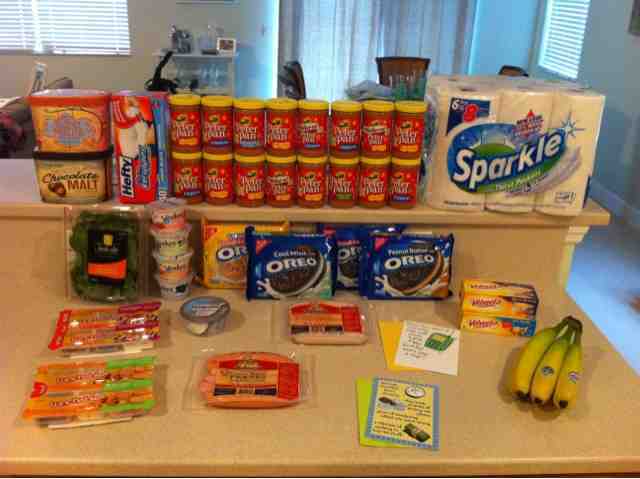 Shopping sale cycles and having a stockpile are two of a couponer's best friends. I also grabbed some ice cream and oreos for some upcoming recipe posts and got some other good deals from the weekly ad and a few things we needed for the next few days of meals/lunches. I split my trip into two transactions so I could use two $5/$30 Winn Dixie coupons. Since I actually used last Thursday's grocery money for today's trip, I should have plenty left in our two week's of grocery cash for this week's sale cycle trip.